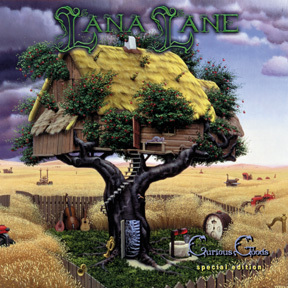 (Los Angeles, 17 May 2002) Think Tank Media proudly announces its release of the LANA LANE - CURIOUS GOODS SPECIAL EDITION, a double CD re-issue of Lana's second album originally released in 1996 in Japan only. The album tracks have been thoroughly reworked for this new issue. Lana re-recorded ALL of her vocals on the album in early 2002 which allowed her to reinterpret the songs with the delivery a more mature artist. The vocal performances are hence much more remiscent of Lana's recent albums, 'Project Shangri-La' and 'Secrets of Astrology'. Producer Erik Norlander has also undertaken an extensive remix of the whole record using the most state-of-the-art modern hard disk recording tools. The album was also necessarily remastered by Norlander following the remix. The result is a much more crisp and precise sound, but Norlander was also very careful not to lose any of the warmth, lushness or character of the original release, learning from his experiences on the 1998 rework of the 'Love is an Illusion' album. The CURIOUS GOODS SPECIAL EDTION also contains a new bonus track, the James Bond theme "You Only Live Twice", recorded with Vinny Appice, Don Schiff and Mark McCrite during the 'Project Shangri-La' sessions. The CURIOUS GOODS SPECIAL EDITION is a double CD. Disc One contains the new 2002 enhanced version, and Disc Two contains the original 1996 version, left intact and untouched. The Pseudonym Records label (Holland) has released this title in Europe. Think Tank Media issues the title in a Slimline 2CD jewel case, Pseudonym issues it in the thicker double CD case. Other than that, the versions are identical. Following her acclaimed 1995 debut, LOVE IS AN ILLUSION, Los Angeles symphonic rock vocalist Lana Lane returns with a powerful artistic vision in her new album entitled CURIOUS GOODS. Like its predecessor, CURIOUS GOODS features Lane's trademark soaring vocals which have been described as "clear, sweet and expressive", "sorrowful", "dramatic" and "angelic". Lane's influences combine 70's rock greats with Jazz and Big Band singers, resulting in a unique style rich from decades of musical adventure. CURIOUS GOODS has a strong focus on melody and harmony without being blatantly commercial. Memorable choruses from tracks such as "Emerald City" and "Voices" are juxtaposed with aggressively symphonic passages such as the angular string fugue in "Symphony of Angels" or the vibrant guitar and keyboard interplay in "Escher's Staircase". Lana Lane is a principal writer on many of the tracks that appear on CURIOUS GOODS. The album started from a series of successful collaborations between Lane and guitarist Neil Citron where the two would pass tapes back and forth, each time adding to the other's ideas. Citron, an accomplished musician and producer himself, was drawn to Lane's music after participating as a session player on Lane's debut, LOVE IS AN ILLUSION. Influenced by guitar greats such as Steve Vai and Jeff Beck, Citron is a master of both technique and timbre. Citron provided the strong musical foundation Lane was seeking for her follow up. Citron brought friend and famed bassist Tony Franklin to the project, who had heard LOVE IS AN ILLUSION and was impressed by the depth and versatility of the music. Franklin hails from Darby, England and got his big break in music playing for folk / blues legend Roy Harper. It was with Roy Harper that Franklin began working with Led Zeppelin's Jimmy Page and ultimately started the band The Firm with Bad Company vocalist Paul Rodgers. After The Firm, Franklin joined former Whitesnake guitarist John Sykes in Blue Murder, which enjoyed huge international success. Franklin brings an undulating groove to the project with masterful prowess on both fretted and fretless basses. Producer Erik Norlander had originally intended to be involved in only an advisory capacity, but after hearing the work that Citron and Lane had produced, he ultimately signed on as producer and keyboardist for the record, writing additional tracks with Lane and Citron to expand the scope of the record. Norlander had recently brought Lane in to sing on the bonus track "Stardust" for his band, Rocket Scientists, on their album, BRUTAL ARCHITECTURE. Norlander was enchanted with the warmth and presence of Lane's vocal on this track, and worked to expand this sound on the closing track of CURIOUS GOODS called "Clouds", which was written by David Gates from the band Bread. Lane had chosen this track for her record, which ironically (and unbeknownst to Norlander) had a very similar chord progression to "Stardust". Norlander brought virtuoso drummer Tommy Amato to the project to complete the lineup for CURIOUS GOODS. Amato, also a member of Rocket Scientists, played on half of LOVE IS AN ILLUSION and became a fan of Lane's as a result. Amato has played for such artists as Warrant, Savoy Brown and Doro Pesch among others, and is a highly sought - after session commodity in Los Angeles. Like Rocket Scientists, Amato cleared his schedule for Lane Lane and joined the project as a full band member. CURIOUS GOODS contains 13 dramatic tracks which Lane selected to define her sophomore entry into the rock n' roll foray. Of special note is the track "Take a Breath" written by longtime friend Tully Winfield and Rocket Scientists bassist Don Schiff. Winfield and Schiff wrote the track "Cold Outside" on LOVE IS AN ILLUSION and wanted to contribute to the follow album as well. The album is framed by the conceptual pieces "Curious Goods Part One" and "Curious Goods Part Two" which combine orchestral timbres and dynamics with Lane's rich vocals -- all without words. Cover art is again provided by Polish artists Jacek Yerka, who painted the incredible cover for LOVE IS AN ILLUSION. The sophomore release of an artist is always a difficult one. In most cases, an artist takes five years or more to arrive at their first album, and then the follow-up album necessarily gets created at a greatly accelerated pace by comparison. It's not that the second (and subsequent) albums are rushed by any means, rather it is that the artist gets put on a "normal" production schedule where they release an album approximately once per year. It went this way for Lana Lane. 'Curious Goods' is exactly that. Lana's first album, 'Love is an Illusion', took five years to create, and the tone and style of the album evolved greatly over this period. We started off 'Love is an Illusion' with a four-piece band of musicians, but as the recording progressed, we grew dissatisfied with the limitations that this configuration imposed. By the time the album was complete, we had recorded with two drummers, two bass players, three guitarists and several backup singers in order to realize our vision. While the result was superb, the process was grueling. We had recorded several of the songs multiple times, and of course it was difficult for us to have to tell so many committed musicians that their performances did not make the final cut. For 'Curious Goods', we wanted to return to the tight focus of a four-piece band, but this time we wanted to use musicians with greater range and breadth in order to ensure the success of the configuration. So it was necessary to find a truly virtuoso lineup. First was guitarist Neil Citron who had been a friend of ours for some years prior and who had also made a brief appearance on the 'Love is an Illusion' album. Neil's band rehearsed next to ours in the Van Nuys rehearsal studio complex where we worked for so many years. Through the months of interaction there, we realized that we all had a lot in common, both musically and personally, and so it was perfect fit. Neil, Lana and I began to write songs together, many of which wound up on the 'Curious Goods' album. Perhaps the two greatest achievements of this collaboration are the songs "Symphony of Angels" and "Escher's Staircase" which are undeniable Lana Lane classics. Fretless bass wunderkind Tony Franklin came to us through Neil Citron. Just before the recording of 'Curious Goods', I had worked with Neil on his solo album, 'Guitar Dreams' (although 'Guitar Dreams' was released in 1998, most of it was actually recorded a few years earlier). Tony played bass on 'Guitar Dreams', and I was completely knocked out by Tony's ability on the instrument. Years later in 2000, Dutch engineer Oscar Holleman would aptly describe Tony as "a very violent bass player". While Tony's personality is quite gentlemanly, his musicality is significantly more aggressive. Of course, anyone that has heard Tony's work with The Firm to Blue Murder to Whitesnake and projects beyond will find this as no surprise. Drummer Tommy Amato and I had played together on a number of projects starting in around 1990, and the most successful of these was the second album by Rocket Scientists, the 1995 release, 'Brutal Architecture'. Tommy and I had reached a good understanding of the balance of progressive versus aggressive, vintage versus dated, atmosperic versus sleepy, etcetera. Tommy was able to combine the fury and groove of John Bonham with subtlety and cleverness of Bill Bruford and the power and weight of Cozy Powell. This was the kind range we needed for Lana Lane, and so Tommy was an easy choice. 'Curious Goods' was Lana's first domestic title in Japan ('Love is an Illusion' was distributed as an import), and it was released in 1996 on the Marquee Belle Antique label. While the reception was good, it was not as spectacular as we had hoped. I deliberately produced the album with a very dry, natural sound in the style of the Rocket Scientists 'Brutal Architecture' album. Since we had religiously maintained the tight four-piece lineup, I wanted to emphasize that "honest" feeling by avoiding too many overdubs and the over-usage of studio gadgetry such as electronic reverb and echoes. In hindsight, I believe that I took this approach to the concept too far. While the four-piece band performed expertly, the conscious restraint I employed in the studio proved to be unnecessary. In subsequent years, I was able to make various remixes of the 'Curious Goods' material for various Japanese compilation releases such as the 1998 'Ballad Collection' and the 1999 'Echoes from the Ocean' EP. Without question, the remixes benefitted from the aural enhancements and sonic expansiveness that the studio tools offered. The liberal use of reverb, echoes, drum sample triggering and surgical equalization all brought the listening experience to a higher level. Now six years have passed since the original release of 'Curious Goods', and the time has finally arrived for this fantastic album to reach its ultimate potential. For this release, Lana has re-recorded all of her vocal tracks for the album, and the mix is considerably more dynamic and exciting as a result of the agressive employment of modern recording studio tools. We have also replaced our original cover of Steely Dan's "Do It Again" with the elegant and spacious James Bond theme, "You Only Live Twice", which was recorded during the sessions for the 2002 'Project Shangri-La' album. With its new audiophile production, I sincerely hope you enjoy this special "2002 Version" of the Lana Lane classic, 'Curious Goods'. The original version of CURIOUS GOODS was released in Japan in 1996 on the Belle Antique label, a small independent progressive rock label. Prior to 2002, this was the only released version. On April 23, 2002, the larger Avalon label released a single CD of only the new version of the album called CURIOUS GOODS - 2002 VERSION. The original 1996 Belle Antique version continues to be available in Japan. The thinking behind this decision was that since so many copies of the 1996 version had already been sold in Japan, it was unfair to force the Japanese fans to purchase a double CD just to get the one CD of the new version when they already had the old version. * DISC ONE contains the 2002 cover of the James Bond theme, "You Only Live Twice"; DISC TWO contains the 1996 cover of Steely Dan's "Do It Again". DISC TWO has a higher total running time because the cover of "Do It Again" is several minutes longer than the cover of "You Only Live Twice".